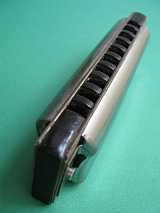 The harmonica is unique among wind instruments as it allows chords as well as single notes. Beginners often play chords, or multiple notes by default while learning to play single notes (not easy at first). Harmonica chords are powerful tools when understood, this article describes the common ones. Harmonica chords are used frequently with second position playing (an explanation of second position is here). Also, chords on the bottom 4 holes are the ones most commonly played, often just two or three notes. Here the more useful second position chords are outlined. Details about using these chords are in my online harmonica lessons at Harmonica Academy. To describe harmonica chords a simple tab is needed. This comprises a number for the hole and “B” or “D” to indicate blow or draw. 4B means blow into hole 4, 6D means draw (or breathe in) hole 6. Brackets around a group of notes means they are played together as a chord. So, (1D 2D 3D) means these 3 notes played together. A harmonica in the key of C is used for second position blues in G, we use it for the examples here. A nice second position feature is that the first five draw hole notes are all from the G7 chord, the starting chord (usually) for blues in G.
Now try the following chords. (1D 2D) sounding like this. This is the root note and 5th of the G chord (for the theoretically minded), and gives a tight punchy sound, great for chugging type rhythms. As you can hear in the track. Now open your mouth a little wider and play the bottom three draw holes (1D 2D 3D), sounding like the track below. Notice that the chord sounds a little fuller. It has the G chord root (2D), the 3rd (3D) and the 5th (1D). Sometimes this fuller sound works well, other times the simpler (1D 2D) chord is better. Try the 4 note chord (1D 2D 3D 4D), sounding like this. To my ears this version of the G chord sounds muddy, and is less useful. Note also that the chords will sound a little different depending on the harmonica tuning. Some harmonicas are tuned to just intonation, others to equal temperament, the chords sound different for these respective tunings. The harmonica in the examples is a Neil Graham custom diatonic in C, tuned to just intonation. If these details make your eyes glaze, just listen to the samples. Your ears will guide you. Finally try the four note chord (2D 3D 4D 5D). This is a G7 chord, with a root (2D), 3rd (3D), 5th (4D) and 7th (5D) and sounding like this. Again, to my ears this four note chord sounds muddy and cluttered, compared to the two note chords shown above. Others may differ with me on this, at the end of the day your own ears choose what sounds best. All the blow notes come are in the chord of the harmonica key (more details on harmonica notes are here). So for a C harmonica all the blow notes come from the C chord. To hear this, blow the bottom four holes together, i.e. (1B 2B 3B 4B), the resulting C chord sounds like this. The notes are the C chord root (1B), 3rd (2B), 5th (3B) and root an octave higher (4B). Now try (4B 5B 6B 7B), a C chord an octave higher, sounding like this. Also try (7B 8B 9B 10B), the C chord from holes 7 to 10. To my ears the higher two blow chords sound less pleasing than the one from the bottom 4 holes. We now examine the two and three note versions of the bottom hole chords. Then the (1B 2B) chord, like this. Simlar to the draw chord counterparts, the two note chord has a tighter more punchy sound. Finally the (3B 4B) chord, sounding like this. The notes are the 5th (3B) and root (4B) of the C chord. Again a tight sound, well suited to chugging rhythms. The sound of this final chord is similar to the (1D 2D) chord, not suprising, as this latter chord is the 5th and root of the G chord. The chords outlined here are the ones commonly used for second position playing. Other harmonica chords can be found, however they are less useful (in my view). Also missing from this discussion is harmonica octaves. These are important performance tools.